The number of unmarried adult women actually outnumbers the number or married women for the first time in US history, according to the Population Reference Bureau, in October, 2010. Women are now earning more, going to college and graduate schools more, and finding ways to become more independent. Also, according to the Kauffman Foundation, single, divorced and widowed women start more businesses as entrepreneurs than men in their respective categories. 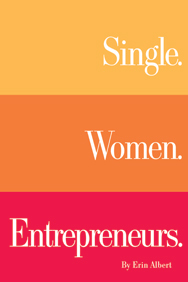 This book interviews 30 single women entrepreneurs throughout the U.S. to discern why they started their original businesses, what the perceived advantages and disadvantages are for the single woman entrepreneur, what they each learned from the experience, and what advice they have for the next generation of women solopreneurs. Erin Albert is a single social entrepreneur (Yuspie, LLC), career entrepreneur (Pharm, LLC), pharmacist, assistant professor (Butler University), student (Indiana University School of Law – Indianapolis) and writer. She has written and developed several books, many of which focus on young professionals. Erin is also a graduate of Butler University, Concordia University Wisconsin, and Shenandoah University. In addition to Single. Women. Entrepreneurs., Erin has written and published five other books. To learn more about the author, visit www.erinalbert.com.